Rinse meat. Pat dry with paper towels. In a large plastic bag combine soy sauce, olive oil, and McCormick Seasoning. 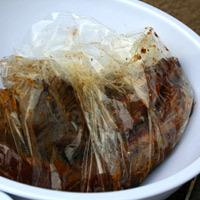 Place meat in bag and coat completely with the marinade. 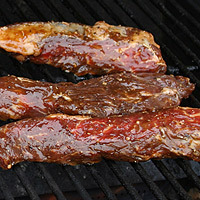 Marinate at room temperature 15-20 minutes or up to 6 hours in the refrigerator. Heat grill to high 10 minutes before grilling. Place meat on grill and lower heat to low-medium. Grill 5-7 minutes. Turn and grill to desired temperature. Remove from grill and rest 10 minutes. Slice. Cook or heat tortillas. 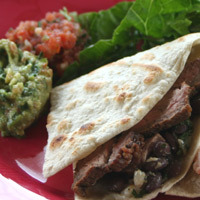 Fill tortillas with steak, black beans and cilantro lime rice. 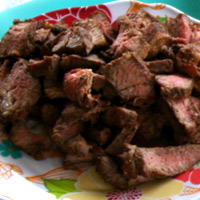 Meat Tenderness- 15 minutes is the minimum for marinating the meat. The optimal amount of time for flavor and tenderness is 2 hours in the refrigerator. Overcooking- meat becomes dry, tough and flavorless when it's overdone. Undercooking can cause safety issues, so choose your level of comfort. I like mine to be just slightly pink in the middle. 1. Rinse meat. (1)Pat dry with paper towels. 2. In a large plastic bag combine soy sauce, olive oil, and McCormick Seasoning. Place meat in bag and coat completely with the marinade. 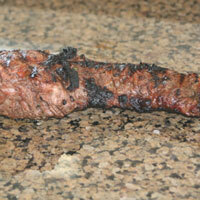 Marinate at room temperature 15-20 minutes or up to 6 hours in the refrigerator. 3. Heat grill to high 10 minutes before grilling. Place meat on grill and lower heat to low-medium. Grill 5-7 minutes. Turn and grill to desired (2)temperature. 4. Remove from grill and rest 10 minutes then slice. 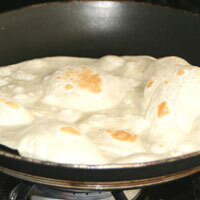 Cook or heat tortillas. Fill tortillas with steak, black beans and cilantro lime rice. 1. Measure (1)rice and set aside. In a separate container, measure water and salt and set aside. Melt butter over medium/high heat. Add rice and cook a minute or so stirring frequently so it doesnâ€™t burn. Turn the heat to high and add water and salt. Bring to a boil. Cover and reduce heat to (2)low. Cook 15 minutes. Turn heat off but keep it on the burner and let sit 15 minutes. Do not remove the lid! It needs the steam to finish cooking. 2. While the rice is cooking, seed and core the jalepeno. Crush through a garlic press. Chop the stems off the cilantro. Finely chop the tops. (3)Squeeze and measure the lime juice.